to everyone around the globe. NOTE ⚠️ iOS Tokens are separate/different from Web/Android Tokens! Because of Apple’s restrictions, digital purchases from other platforms (such as web, Android or Paypal) cannot be used within iOS apps. It is why we cannot display the tokens from other web platforms inside the iPhone app, or why your Token amount is different on Web vs iPhone. However, chapters unlocked are synced across platforms (*excludes certain restricted or Mature titles, which can only be accessed on web). - Tokens purchased on Website can only be spent on Tappytoon Website or Android app. - Tokens purchased on iOS app via in-app purchase can only be spent on iOS app. This is a requirement for iOS apps per Apple, and a condition for us to provide Tappytoon as an app through the official Apple iTunes App Store. We cannot make exceptions nor refunds regarding such issues related to Apple or iOS, as Apple controls payment processing and does not permit developers to access such functions. My Tokens are missing or gone! - Tokens purchased in the iOS app can only be spent in the iOS app. - Tokens purchased from Southeast Asia through third party Android app markets cannot be spent on other platforms. - Tokens purchased on the website can only be spent on the website and Google Play app. - Web Tokens cannot be spent in the iOS app. - Any content you've unlocked will sync across all platforms (Android, iOS, Web) and remain unlocked for that same registered account. (*Excludes mature or restricted titles, which can only be accessed from the Website or Mobile Website, under the account they were unlocked from). I purchased Tokens but did not receive them yet! We’re very sorry for the inconvenience; this may happen for a number of reasons beyond our control such as declines from your card or payment company, or momentary connection errors. Please ▶︎ reach our Support Team here ▶︎ and we'll get back to you soon. On Website, you can use Paypal (or use a guest login without Paypal account) to buy Tokens. On Android or iOS app, you can buy through in-app purchase. The more Tokens you buy at once, the more you save! You'll also get some bonus Points right away with each purchase. After a successful purchase, your Token & Points balance will be updated. Tokens purchased on Website can only be spent on Website or Android app. Tokens purchased on iOS app can only be spent on iOS app. Spend Tokens shown, or the indicated Points to unlock premium chapters permanently and view them again on any platform. Read on below for more about spending Tokens or Points to unlock chapters. * NOTE: Thank you for supporting your favorite creators by spending tokens. Each and every chapter on TappyToon is made possible by the hard work of artists, creators, and even translators. Your help makes sure they can continue drawing, coloring, creating and sharing these awesome stories and characters we all love. 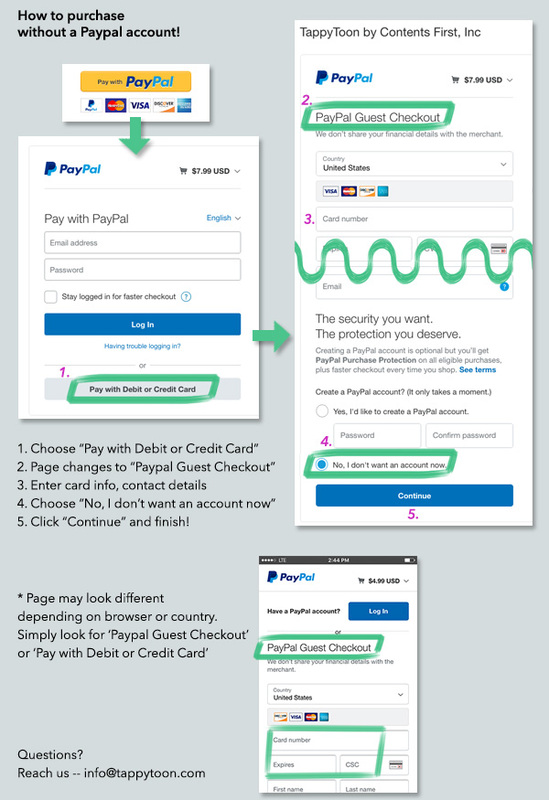 You can buy Tokens without creating or signing into a Paypal account, by using your credit or debit card in “Guest Checkout” — see the below steps. Because the entire process is still safely protected by Paypal’s security measures, your personal card info and other details are never shared with us. Chapters marked in the corner with a Token icon and price number are "locked" content. Spend Tokens to unlock and view it. A chapter or pack of chapters can only be unlocked with Tokens once per account. You can never be charged more than once to view it, as long as you login with the same registered TappyToon account. Once unlocked and linked to your account, a "check" mark will be shown on the chapter(s) (instead of the token price) across all platforms (Android, iOS, Web). This check mark means you have unlocked it before. You can view it again any time. If you don't see the check mark at a later point, try log out and back in to refresh your session. Some series have "Unlock All" type of items, so that you can unlock many chapters of that particular series at once. These "Unlock All" items will unlock all the chapters indicated in the description. These chapters will then all have the “check” mark instantly and be linked to your account. You can spend Points to unlock chapters. - Chapters unlocked with points are also linked to your account and stay unlocked across all platforms (Android, iOS, Web) and 'get checkmarked'. You can view them again any time. - Points cannot be used for "Buy All" or unlocking multiple chapters at once. 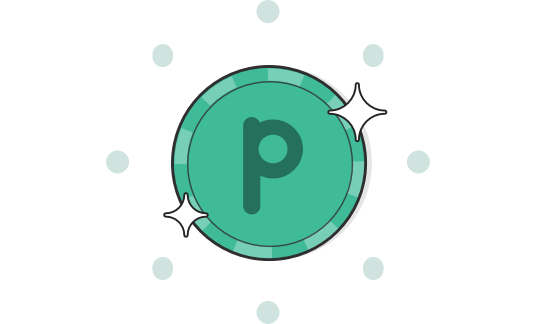 - Points are given to you as a bonus for purchasing Tokens. (Points cannot be purchased separately). What is the difference between episodes and chapters? They mean the same thing: one portion of a particular series or comic. There is no difference in how the words are used on TappyToon. About episodes marked with "FREE" instead of a Token price. - Episodes marked FREE are not associated with your account. - Episodes marked FREE are subject to change and may become locked with Tokens at a later time. At that time, you may have to use Tokens to unlock them. What's the (A) mark next to certain chapters? - (A) means that chapter can be viewed once by watching an Ad. If you try to view it again later, you will see ads again. - Sometimes there is no Sponsor or Ad available, and you'll have to check again later. - Viewing a chapter this way does NOT link it with your account. To permanently unlock a chapter (and not see ads for it), you must spend Tokens or Points. * NOTE: We hope you'll consider tokens next time! Each and every chapter on TappyToon is made possible by the hard work of artists, creators, and even translators. Your help makes sure they can continue drawing, coloring, creating and sharing these awesome stories and characters we all love. Please send an email and we'll get back to you as soon as we can.